The Hechinger Report recently highlighted a 2016 study analyzing “off-task” behavior in elementary school students. You can read their excellent summary here: Teachers often ask youngsters to learn in ways that exceed even adult-sized attention spans. The study itself can be found here, though it’s behind a paywall. The research was paid for by the Department of Education, and I will never understand why the results of publicly funded research are only accessible if you pay for it! Basically, the research found that in elementary school, once whole class instruction exceeded ten minutes, then off-task behavior began to increase – and this result was consistent in every grade and did not differ by socio-economic status. 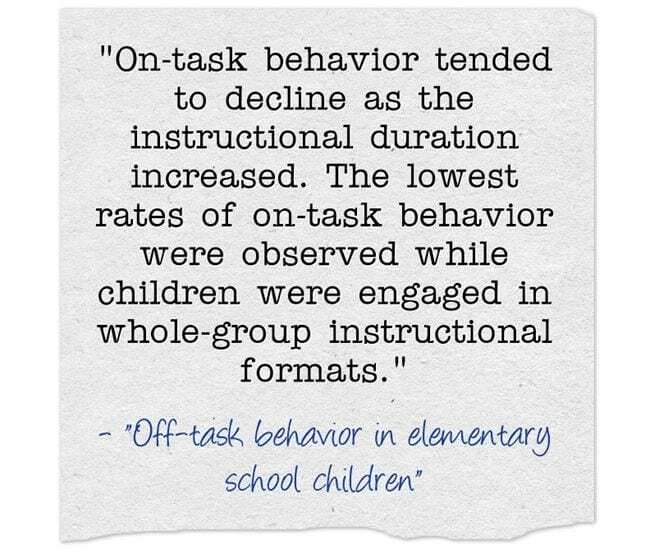 They also found that off-task behavior was reduced in small group activities. I was also surprised by this tidbit from researchers: the typical adult attention span is 15 minutes, which suggests that the percentages are probably not much different in older grades. These results certainly suggest that we should do what most good teachers know instinctively – we need to mix things up a lot in the classroom. They would also seem to support the thesis of this post: The Best Research Demonstrating That Lectures Are Not The Best Instructional Strategy.